Discussion in 'JK Handmade Knives' started by JK Knives, Nov 3, 2018. What model do you (from personal experience), consider the best model. Must use AA batteries. much like knives, there's no such thing as "best" - but I'm a fan of the surefire protac and fenix PD/LD series single AA and AAA lights. as a budget light, Wally sells a nice 3-color (white, red - for night vision, blue - for game tracking) Bushnell branded light that I carry on my hunting bag and have one next to the bed. indoors I try to limit my lights to less than 100 lumens -- it gives me better run time and reflection off walls doesn't impair MY vision. I am a fan of Fenix, I’ve got several of those. Another one that has impressed me is the Coast brand, I’m liking the single AA model I got from Home Depot. The Fenix LD22 takes 2 AA batteries and is the one that fills that slot in my lights ... had it several years and I think it's a great light and not crazy expensive. I love Surefires but found Fenix give more batteries options and usually higher lumens and definately longer run times I've found from personal usage. If you want a single AA light the Fenix LD12 is my small light choice. I need to check which Fenix models I have. One is 2AA, one is 1AA, and one is 1AAA. I'm also a Fenix fan, however I prefer the CR123 batteries, or even better yet a rechargeable CR123. On my key chain I also have a Four Sevens Mini ML with a rechargeable 123. It's super bright (500 ish lumens) and the charge lasts for months. While I don't have the AA model, I would imagine the quality would be comparable to my single-AAA model. They make single- and double-battery versions of both the AA and AAA flashlights. I love my Maratac from County Comm. I use Eneloop batteries in my AAA. 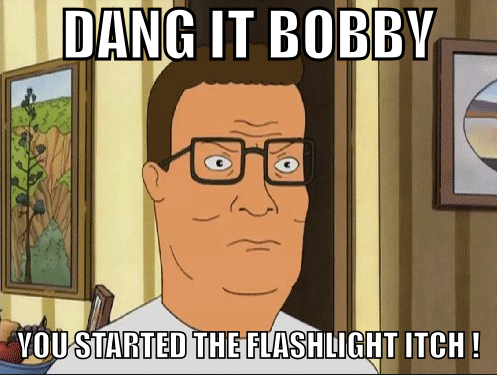 This flashlight is on me from the time I wake up until the time I go to bed. 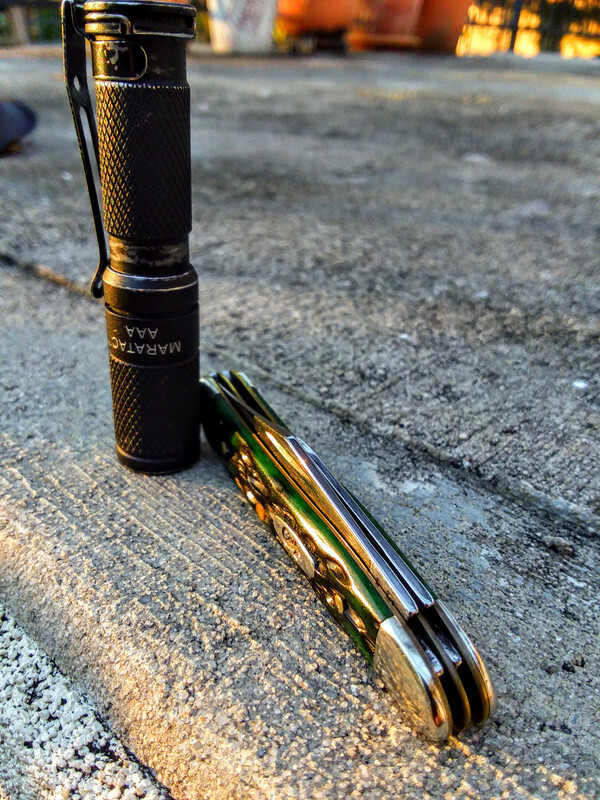 Super simple, twist to turn on, three brightness modes, pocket clip, and tail stands. Nothing you don't need. TheZenful1 and mykel m like this. the regular Enloops I believe give over 2000 charges but don't put out quite as much performance. I prefer 18650 lights but I also keep AA models because they are more readily available ... but I highly recommend the Enloop rechargables they will pay for themselves in short order and don't have to worry about leaks like alkaline AAs. Malkoff is really nice too. Will last forever. If you want a bomb proof light malkoff is where it's at for value. I run surefire on duty and they are hard to beat but can be expensive. Streamlight makes some decent stuff too and then you can get in to high end customs. But I think malkoff is awesome for the monies. Wanted to post a picture of my favorites while I was charging batteries. I just got the middle light because I thought I lost the E12 and it came with a rechargeable battery for about 50 bucks and it's brightest is about 300 lumens really liking it so far fits my daily needs perfectly. But the E12 is by far my favorite small AA light iv used to date just provides the right amount of light for me in everyday tasks. The PD35 Tac is what I use if I'm going outdoors or would need a lil more umph. I've had it for about 2.5 years now I think and it's been an amazing field light for my wildlife biologist work and with fenix's 18650 rechargeable battery I get really good run times. I also have one of olights origional M10 Maverick series lights and I really wish they still made them. There a whole lot more reliable/tougher than the newer models from my experience. It's a single CR123 that's about 300 lumens and it's been put through hell on multiple wildlife captures and a lot of south Texas ranch work. Since Ty brought this one back up (thanks, Ty!) - I'll add that I have been carrying my Fenix with a CR123 for several years and love it. I have a few AA battery lights and they just don't throw enough light for me, I like having the 500-600+ lumens when I need it, like outdoors at night. I need to stock CR123 batteries for my Eotech optic anyway, so it's no big deal to have a dozen on hand to swap out when needed. Fenix customer support was really good when I lost my clip - they sent me a new one in three days and would not take any payment for it, even though I had owned my light for several years. Much like this knife hobby, the flashlight hobby is another rabbit hole. Good luck Alice. Indeed - my membership on the Candlepower forums predates my BF membership by several years. I have a 10M candlepower Thor spotlight - it's like a barge light and I can light up a field with that puppy - it's got a battery like a lawn tractor in it. mqqn, ty_higg and JK Knives like this.